Apparently a good number of others had the same idea. The tiny parking lots were packed. We circled. So Jon dropped me and the boys off at the trail head and set off to procure parking. This is where our stories diverge. We hung out in the park area near the loading zone for a bit. 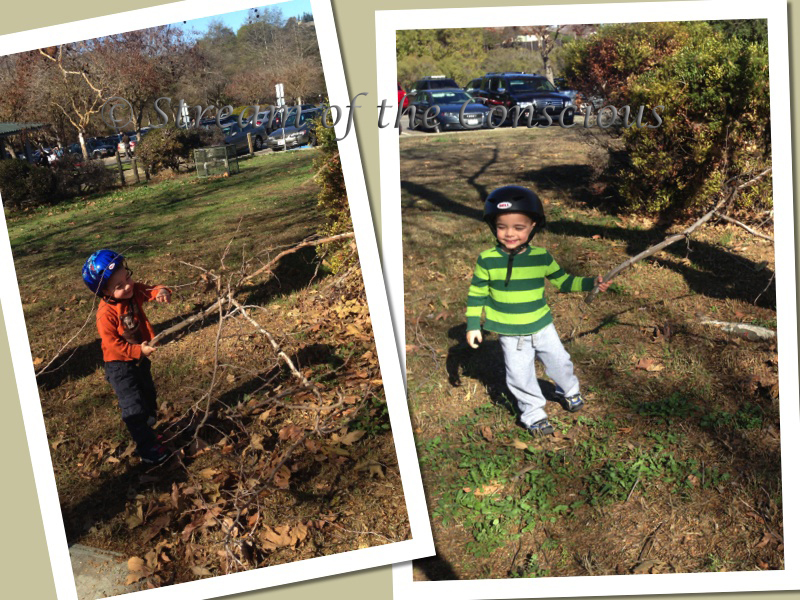 The boys found a large tree branch and spent a bit of time trying to reunite the branch with its former botanical being. I kind of figured if they could climb the tree – more power to them. Finally, the boys and I decided to venture forth. Jon would be able to easily catch up just as soon as he parked. 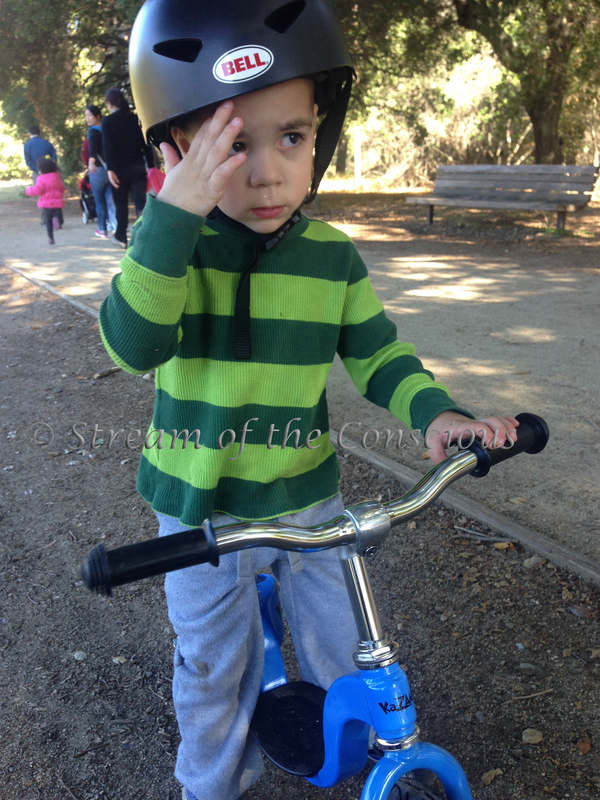 The boys both have balance bikes – these are exactly like regular bikes, but without pedals. The general idea is that kids will figure out the balance concept while scooting themselves along with their feet, then when presented with a pedaled two-wheel contraption they’ll just take right off. Ahead of us sprawled the rough grass terrain of a meadow teaming with wildlife. Birds flitted among trees twisting upward in the dry air; the aging Bay Laurel giants reached toward the heavens. A trickling stream showed a bit of life as cottonwood thirstily drank from the offerings of recent rain. And the squirrels scampered through the fields, hiding among the chaparral, manzanita, and birch-leaf mountain mahogany shrubbery. The gas light appeared. Despite the grave warning, Jon continued to circle. “To the farm!” we proclaimed as we mounted our rides, deeply breathed in the dusty air and pressed forward down the gravelly dirt path. 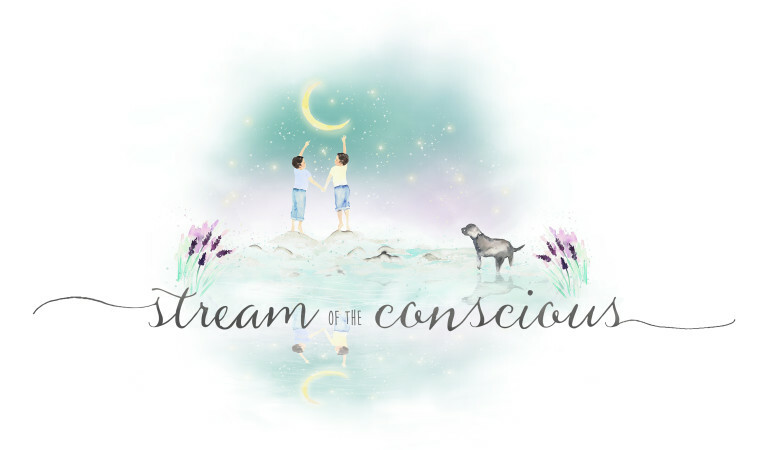 The boys raced faster and faster down the road – swerving in, out and around the multitudes of hikers, joggers and several groupings who seemed rather befuddled about where they were and/or how they got there. The peaks and valleys of our route were nothing more than a bunny slope, adding to Search and Destroy’s confidence as they rode along. We crested the peak of the slope (really just an overeager dirt pile) just before the fork in the road. 1.0 miles to Deer Hollow Farm. “Be careful,” I cautioned. Resolutely they put their feet down to counter-act the downhill descent in front of them. Alas, gravity is a powerful opponent. Destroy made it a quarter of the way down. His feet held no traction against the loose dirt of the trail. I saw his bike tilt left as Destroy performed what could only be described as an ungraceful leaping dismount. He tumbled against the side of the hill. Suddenly, Search FLEW past us. Legs up he shot down the hill like a professional mountain biker – clutching at his handlebars and a look of sheer terror on his face. The front wheel turned inward, losing its tread. Search was thrown from the bike. He summersaulted over the bike in a vault that would make his gymnastics coach proud and skidded several feet further through the dry brush bordering the hilly crevice of the county park. Even Destroy was momentarily stunned into silence. Blood oozed from Search’s forehead. A giant bruised goose egg immediately emerged atop the very same spot wounded in last month’s staircase tumble. 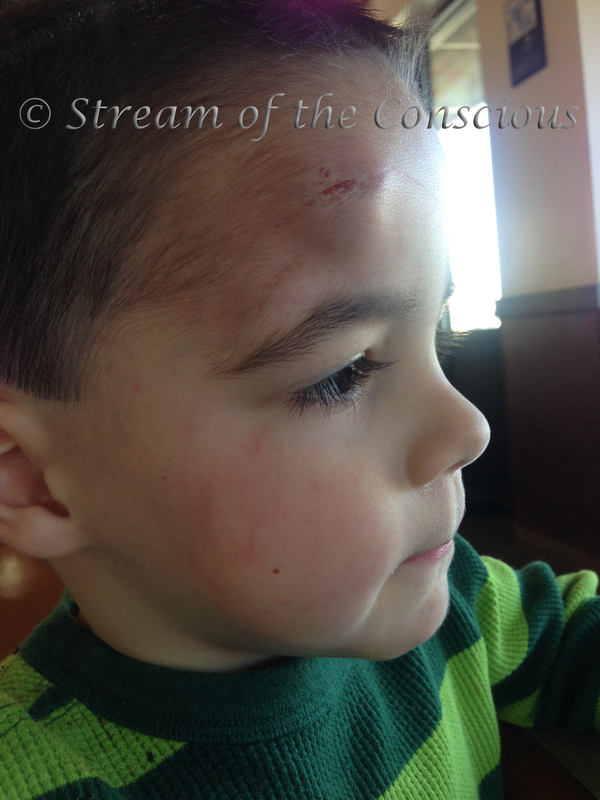 Red scratches streaked down the side of his cheeks. His shoulder bore the brunt of the impact and came away with the visual remnants of an unexpected airborne journey. “I want to go home!” wailed both boys in harmonic shell-shock. Jon finally found a parking spot and pulled in. “Ok, just parked,” Jon texted. Jon pulled out of the parking spot and headed back to the loading zone where we had initially begun our duel adventures, 20 minutes prior. Once receiving resolute confirmation that we were indeed headed back home, Search re-mounted his bike and set off toward the trailhead in full pout mode – proudly sporting his well-earned coating of blood, sweat, tears and dust. “Good job getting right back on your bike, bud!” I praised. Because honestly, I was seriously impressed. 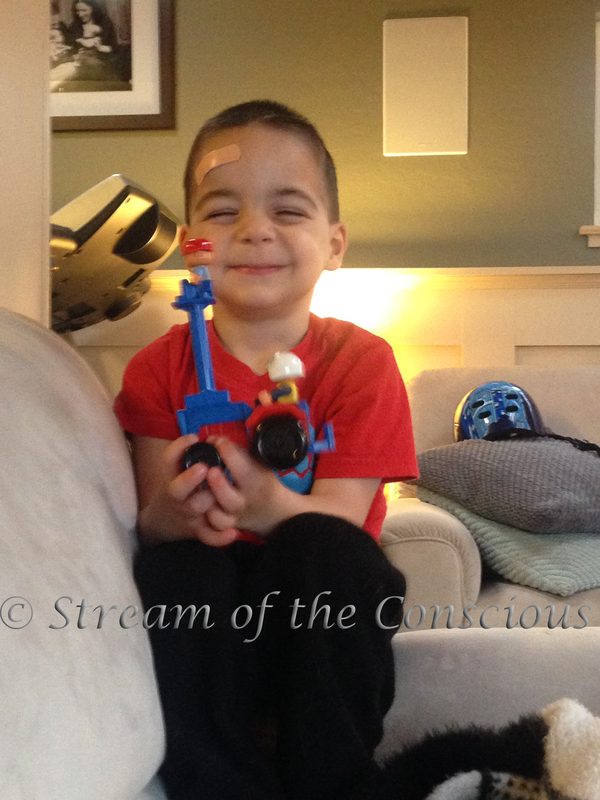 “I have an owie,” Search informed me. We skipped the farm. Instead, we returned home to our own personal family circus – where there were Band-Aids and chocolate milk to be found. Ahhhhh Search! A true fighter and warrior! Kisses for the boo boo…and props to mommy for setting out on the ride without benefit of another adult… I would of been reluctant! You rock. Good one! I am hoping this will be the spring in which my children learn to pedal and steer at the same time. 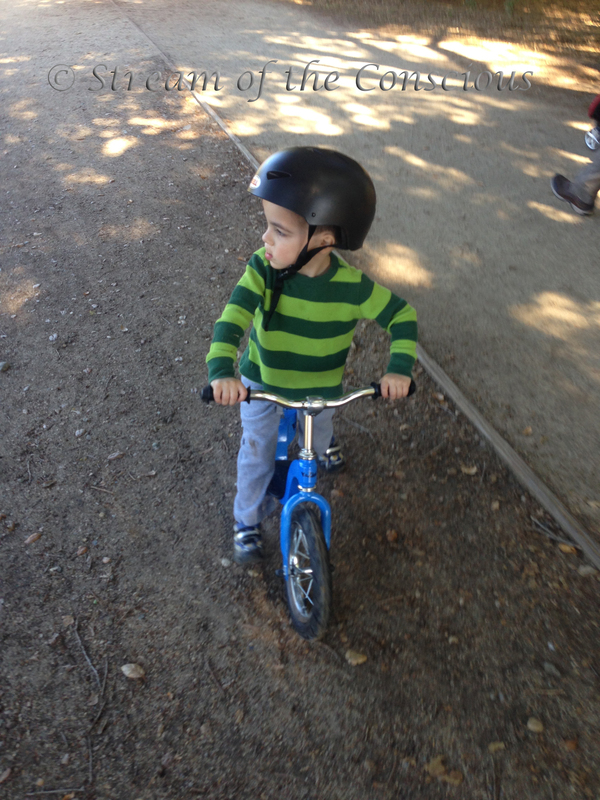 Last bike riding lesson left me in tears.